The wines I'm writing about in this feature were originally to be part of an Easter article, suggesting you pair sparkling wines with your Easter meal. Unfortunately due to a shipping mix-up, the wine didn't arrive in time. Allow me to clarify though, sparkling wine should be enjoyed year-round. It's always a good time for bubbles. Fast forward several weeks and I had occasion to open the 2005 Domaine Carneros Le Reve Blanc de Blancs and NV Domaine Carneros Cuvee de la Pomadour. Our good friends Lars and Dave were celebrating their wedding anniversary and stopped by on their way home to say hi and catch up. Seeing as we get together all too infrequently, I decided that we were going to open a special bottle of sparkling wine and chilled the Le Reve immediately. Knowing its provenance, I anticipated a wonderful experience for us on that special day. Domaine Carneros is owned by the famous French Champagne house Taittinger, which was founded in 1734 in the city of Reims. Over the years it has established a reputation as one of the foremost Champagne producers in the world, so when the Taittinger family started Domaine Carneros in Napa Valley, there was considerable expectation put in place. That was back in 1987. Since then, the Taittinger family has always exerted a light touch, allowing CEO/Founding Winemaker Eileen Crane to go about her pursuit of great sparkling and still wines with considerable freedom. The selection of Carneros in Napa Valley was no accident either, and the region is now home to many of California's most admired pinot noir and chardonnay vineyards. As of now, the estate produces six sparkling wines, all done in the methode champenoise style. Methode champenoise means that the wines are made the same way as in Champagne, with the wine undergoing its secondary fermentation (the one that produces the bubbles) inside the bottle. That's the quick way explain, but there are many other factors that make this method unique when compared to others such as carbon dioxide injection or the Charmat Method. How were the wines, you might ask? Beautiful aromas of lemon peel, brioche, red apple, and bracing minerality. This is 99% chardonnay and 1% pinot blanc. On the palate it's creamy and smooth while retaining a pleasing lightness. Flavors of cake frosting, golden apple, spiced lemon slices, and a yeasty richness emerge from the bubbles. The complexity is what you'd expect from a wine with this provenance, in a word: impeccable. That said, I'm equally amazed with the integrated flavors, a testament to the vintage and time spent on the lees. After each sip I reflected on how much it felt like a complete experience, so good was the balance. One of the best California sparkling wines you can buy, period. $95 SRP. This wine pours a beautiful rosé color, and when held up to the sun it reminded me of bright, shiny copper reflecting the sunlight. A beautiful bouquet of flavors wafts out of the glass, among them strawberry, brioche, hints of orange zest, and a lovely, delicate potpourri. While not quite at level of the Le Reve, this rosé (58% pinot noir, 42% chardonnay) does have a fine bouquet. On the palate it's light and dry, with plenty of tart red fruit and citrus, lifted by vibrant acidity. Fine, delicate bubbles create a lovely textural sensation that only ends many seconds after you swallow. Again I found the balance of flavors to be excellent. For a brut rosé, this is a wine I'd happily pour for a group of Champagne lovers, blind. At a suggested retail of $45, but available at $35, it's half the price (or more!) of brut rosé Champagnes. Both of these sparkling wines were excellent, and much to my delight, neither showed any signs of oxidation. 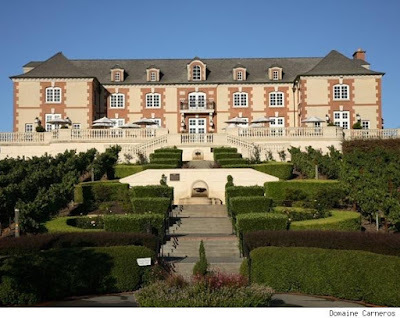 This is a testament to good winemaking, as well as perhaps indicative of the committment the Taittinger family has to making Domaine Carneros the best sparkling wine producer in the United States. With wines like these, I suspect they're close to accomplishing that goal. For the 2005 Le Reve, I'd suggest pairing almost anything with this wine, short of a steak. I'd have enjoyed some oysters, lobster, caviar, or even more humble fare like fried chicken and french fries. Honestly, the wine would have been amazing even with a pizza. For the Cuvee de la Pompadour, I'd have paired it with grilled shrimp or chicken, anything fried, or even some berry sorbet.